A new report out today from the Centers for Disease Control and Prevention says cancer is now the leading cause of death in California and 21 other states, surpassing heart disease. 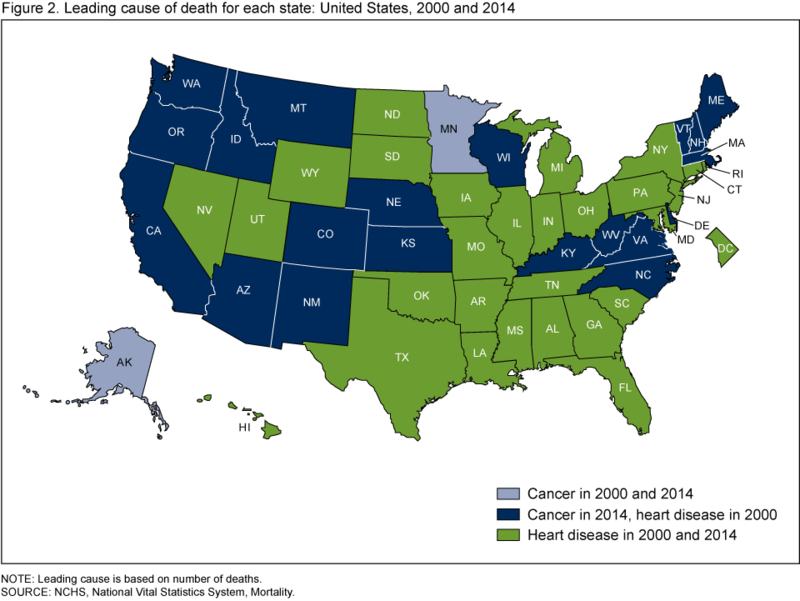 Back in the early 2000s, only Alaska and Minnesota lost more lives to cancer than heart disease. And back in the 1950s, heart disease deaths were overall 2.5 times the number of cancer deaths. Nationwide, heart disease still edges out cancer as the top killer of Americans. In 2014, 614,348 U.S. residents died of heart disease, compared with 591,699 who succumbed to cancer, according to the Centers for Disease Control and Prevention tally of death certificates from the 50 states and the District of Columbia. The report was published Wednesday by the CDC’s National Center for Health Statistics. • Heart disease has consistently been the leading cause of death in the United States and remained so in 2014. • The gap between the number of heart disease and cancer deaths generally widened from 1950 through 1968, narrowed from 1968 through 2012, and then slightly widened again from 2012 through 2014. • The mortality burden of cancer has surpassed that of heart disease in several states. In 2000, there were only 2 states where cancer was the leading cause of death; in 2014, there were 22. • Heart disease remained the leading cause of death for the non-Hispanic white and non-Hispanic black populations in 2014. • Cancer is now the leading cause of death for the non-Hispanic Asian or Pacific Islander and Hispanic populations. The timing of the leading-cause crossover varied by group.